Sculptor Griffin Stone may look just like his father, but that’s where the similarities will end — if he has anything to say about it. Griffin’s watched his mother live with his father’s physical abuse for years. He knows what the statistics say. He’s more likely to become an abuser since his father’s one. So, Griffin’s going to avoid a relationship at all costs. He’s not willing to put a woman he loves at risk. That’s why when Griffin meets aspiring photographer, Frankie Moore, he knows he should walk away. There’s something about Frankie that draws him to her, something he’s afraid may wake the beast inside him. Aspiring photographer Frankie Moore knows she’s more impulsive than she should be. She makes decisions without weighing the consequences. Things don’t always turn out the way she hopes, but she can always see the positive in situations and people. Frankie sees the positive in Griffin Stone from the moment she meets him. She just needs to help Griffin to see it, too. I love when books grab my attention from the very first sentence or paragraph. It’s amazing when just those few words have me wondering what will happen before I get to the words “The End.” Shatterproof was one of the rare books that did just that. Shatterproof started out strong and never once faltered. From the beginning, I loved Griffin but feared for him. Would he become an abuser? Would he be able to handle a relationship with Frankie? Could he come to terms with his childhood? What would be the straw that broke the camel’s back? He seemed to be moments from combustion at all times. And then there was Frankie. She may have judged herself to be a flake, but I only saw a sweet young woman who wanted to see the best in everything and everyone. She certainly only the saw the best in Griffin. I kept wondering what she was really getting herself into. I hoped it was a good thing, but I was scared for her, too! I didn’t know what K.K. Weil had in store for readers. Was she giving us a happily ever after or a cautionary tale? It was all so intense!!! I was on edge the entire time wondering how things were going to end for Griffin and Frankie. They were both so broken in their own ways. I wanted them to become whole together. I’m not going to tell you how it all plays out because I don’t want to ruin the story for anyone. I’m just going to say that I think K.K. Weil did an amazing job portraying a young man trying to break the cycle of abuse. The story felt raw and real. I would highly suggest Shatterproof to readers looking for an intense NA contemporary romance with real life issues. **I was provided an ARC of Shatterproof by the author in exchange for an honest review. 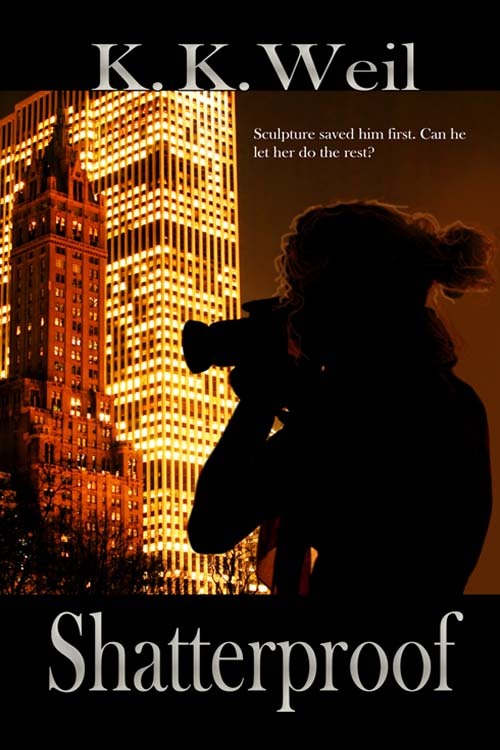 This entry was posted in Contemporary Romance, New Adult and tagged Artists, Coming of Age, Contemporary, Fiction, Intense, New Adult, Romances, Violence by anovelglimpse. Bookmark the permalink. This sounds like a great NA novel, with likeable characters and a really good romance! I’m always on the look out for great NA novels so I’ll have to add this to my wish list. Great review, Deanna.